Our community's ratings & reviews for this villa. We just launched a brand new review system, so some villas are currently lacking in reviews... perhaps the guests liked it so much, they never left? 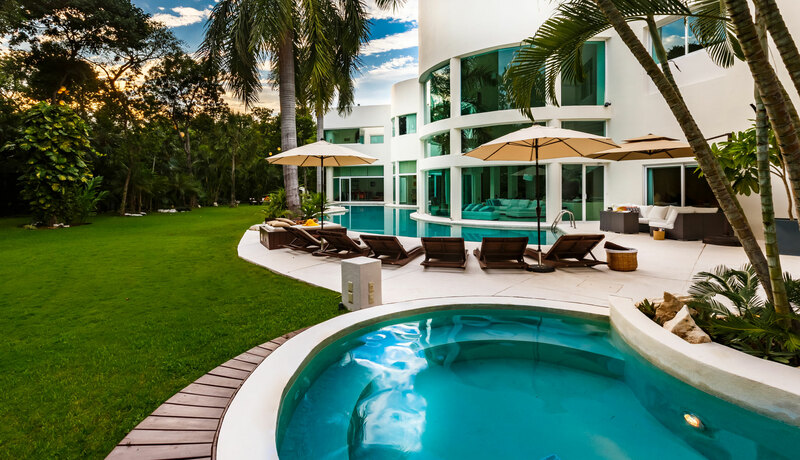 Flowing curves, swimming pool and lots of luxurious space… Villa Aqua is full of light and space with multiple living areas, gourmet kitchen and much more to enjoy on holiday in Mexico. Villa Aqua is in a privileged location. It is just a few minutes’ walk to the beach and is also very close to downtown Playa del Carmen. A relaxing 10-15 minute walk will take you to “La Quinta Avenida”, the heart of Playa, where you will find shopping, dining, and entertainment. Perched at the end of the street with its massive half turret and cubist pop-art exterior, Villa Aqua is more like a modern castle than a villa, complete with a moat-like swimming pool and wide lawn on its garden side. A wide front door swings open to its great room, an expansive area that creates the illusion of being outdoors by means of its interior garden, high ceiling and curved glass wall. Windows cover the entire side of the room. The dining room has its own set of ceiling-to-floor windows and a dining table that sits up to 10 people. *applicable for specific villas only, please inquire for details.